Mims has inherited my dislike of foot coverings, and so she only wears shoes and socks for the absolute minimum of time required. She removes her shoes and socks in the car trip to the supermarket, just to have to put them back on when we arrive (total time in car: 3 minutes). She wears Uggs a lot. It's just easier. 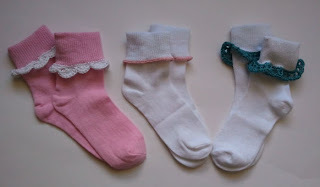 If you'd like to make a pair of ruffled socks for your girly-girl, I used a really simple shell pattern that I think looks great, but isn't so much work that I will be heartbroken when I can only find one of them in the dryer. R1: sc around edge of sock, aiming for a multiple of 14 stitches. You can fudge this a little, so don't worry about it too much. Just get close. Sl st the round closed. R2: ch 1, sc in same space, *skip 3 stitches, 7 trc, skip 3 stitches, sc, skip 2 st, 5 dc, skip 2 st, sc* around to create the shell border. Sl st the round closed. Fasten off. Weave in ends. Thanks Fi! It was ridiculously easy. I know, right? I saw some at Target today for $5 a pair. They are so cute, but so pricey! Or maybe I'm cheap because I can make them myself? LOL!!! When crocheting the edge - will the sock loose it's 'stretchiness"- making it hard to slip on?